Stretch marks are caused by many factors including pregnancy, puberty, and weight changes and are practically unavoidable. Even though they are extremely common, unwanted stretch marks rarely go away on their own. 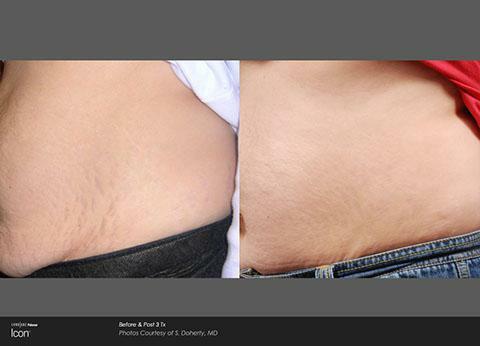 Now, there is a laser treatment that can help remove stretch marks and increase your self-confidence! The Icon uses fractional laser light beams to penetrate the surface of the skin and encourage new skin cell production. The immune system responds to the laser treatment, and new skin cells are produced to naturally heal and rejuvenate stretch marks. 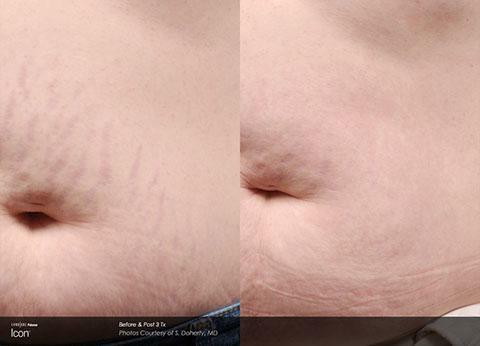 As new skin cells fill in the stretch marks, they will gradually fade away without causing any painful side effects. Depending on the patient’s skin type, three to five sessions are often recommended to achieve the best results. 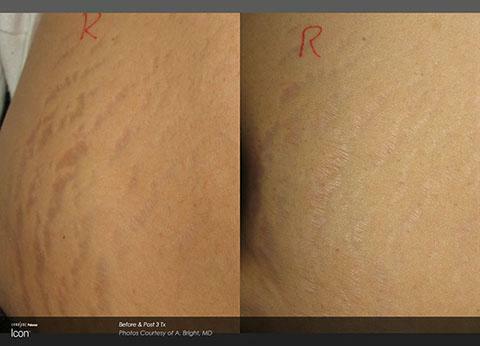 Laser stretch mark treatments are safe for most skin types. Patients may experience some discomfort during the laser application, but a cooling cream can be provided to make the procedure more tolerable. The side effects typically include some temporary redness and swelling. However, most people are able to resume their normal activities immediately following treatment without experiencing any downtime. Stop covering up stretch marks and contact Le Santé du Miroir Laserplasty to set up a consultation today!